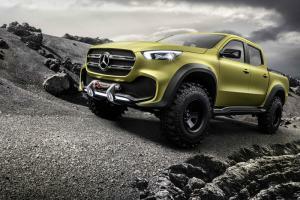 Today, Mercedes-Benz unveiled its new Concept X-Class, offering a preview of the design of its forthcoming pickup model that’s expected to arrive in production form in late 2017. 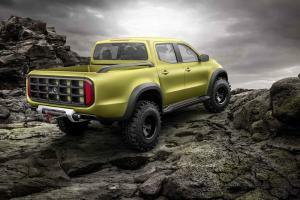 The company claimed their pickup would marry the best of two worlds – tough, functional off-road credibility with power, driving dynamics and style. To underline this, Mercedes unveiled the X-Class in two concept forms: one, dubbed the ‘powerful adventurer’ featured searing green matt exterior paint, carbon wheel-arch extensions, 35 x 11.50 mud terrain tyres, a front bumper-mounted electric winch, and chunky grille styling. The other, ‘stylish explorer’ concept, arrived in white metallic with 22-inch alloy wheels and low-profile tyres, and wore a more SUV-like front grille. Both feature a distinctive continuous LED light strip at the rear, although it’s unclear whether this is likely to make it into production. The interiors also differ – premium materials such as open-pore smoked oak, brushed and polished aluminium and fine nappa leather feature in the more style-oriented model, while the more adventurous concept carries a bold colour scheme and carbon elements. 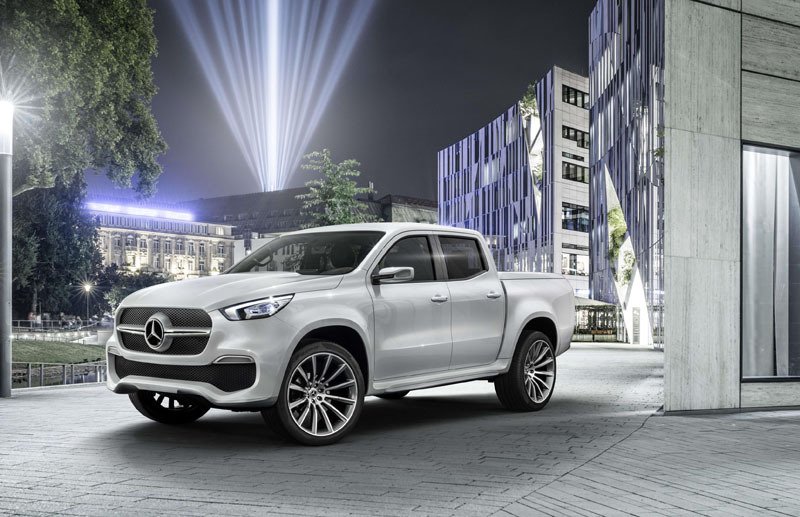 Mercedes is keen to highlight that the X-Class will bring the latest telematics and infotainment systems to the pickup market, with a similar controller to that used in the company’s passenger cars and a floating-style display. A communication module can accept its own SIM card and allows a variety of connected services such as accident recovery, maintenance management and vehicle status updates. Power will come from a range of engines topped by a V6 diesel with 4Matic permanent four-wheel-drive. Off-road capability will be assisted by an electronic traction system, low-range transfer case, and two differential locks. A tough ladder frame chassis supports load carrying of more than 1.1 tons, while up to 3.5 tons can be towed – Mercedes likens this to carrying four cubic metres of firewood while also towing a sail boat. 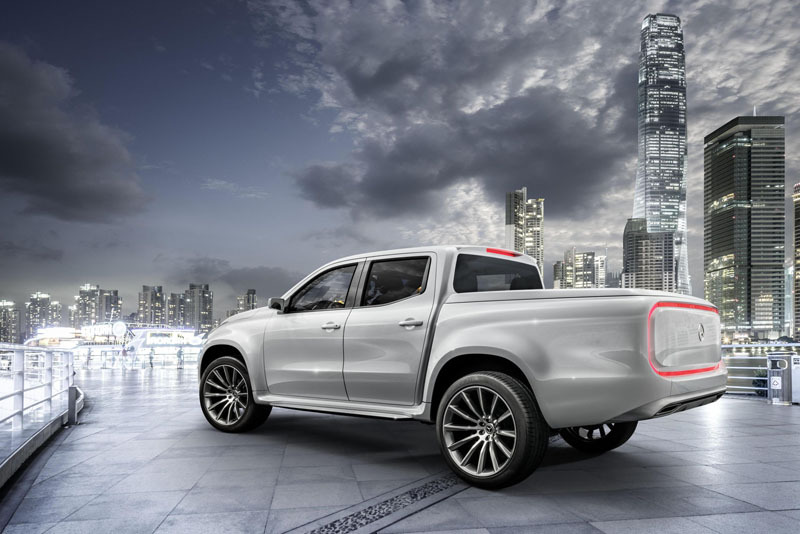 However, the X-Class will be unique in the market in its use of a five-link rear axle with coil springs, while most pickups use leaf-springs for their load carrying ability. In a collaboration with Renault-Nissan, production will begin in 2017 at Nissan’s Barcelona plant for models destined for sale in Europe, Australia and South Africa, while models for the Latin American market will be produced in Renault’s Cordoba, Argentina, plant starting in 2018.